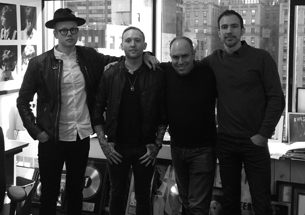 FOREST BLAKK SIGNS WITH ATLANTIC RECORDS: Pictured (l-r) at Atlantic’s headquarters in NYC are Chris Stiller (Forest Blakk band mate), Forest Blakk, Pete Ganbarg and Trey Mills. Forest Blakk’s music was introduced to Pete Ganbarg, Head of A&R at Atlantic Records during a meeting he had with Sat Bisla, President & Founder of A&R Worldwide earlier this year. Subsequently, legendary A&R man and Sire Records Co-Founder & Chairman Mr. Seymour Stein discovered Forest Blakk at a MUSEXPO showcase in Los Angeles this year. Shortly thereafter, Forest Blakk and long-time, worldwide manager Trey Mills held a series of meetings with Atlantic executives and Stein. “We’re excited to have a strong team with the addition of two of America’s iconic record labels, Atlantic and Sire, and to bring Forest Blakk’s music to fans around the world,” says Trey Mills. 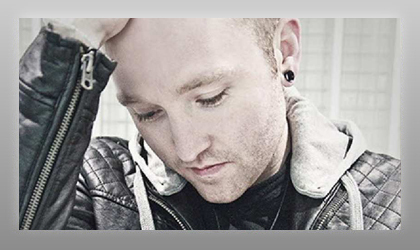 Forest Blakk recently confirmed booking agency representation with the Paradigm Agency in N. America and CODA for the UK & Europe and will begin writing and recording new songs for his debut major label album to be released next year. For more information on Forest Blakk contact Trey Mills at trey@unboundbysound.com, or log on to www.forestblakk.com.